Born in London, Hearne joined the British Royal Navy in 1756 at the age of 12 as a midshipman and saw action during The Seven Years War (1756-63). In 1766, leaving the navy, Hearne joined the Hudson's Bay Company as a mate on its sloop, Churchill, which, of course, brought him to the company's posts on the western shores of Hudson's Bay; he soon had extensive shore duties. In time, he learned how to deal with the natives thereabouts. This gave him an understanding of their language; their way of living off the land; and, their techniques of travel, by which they were able go over great distances. Hearne's second journey, I think a year later, did not amount to much as he ran out of supplies. For his third journey he put a group together which included only one European, himself; the rest being a select group of Chipewyan, under their leader, Matonabbee. "This third expedition set out in December 1770, to reach the Coppermine River in summer, by which he could descend to the Arctic in canoes." (See Map) And so, the trip was made, making Hearne "the first European to reach the shore of the Arctic Ocean by an overland route." 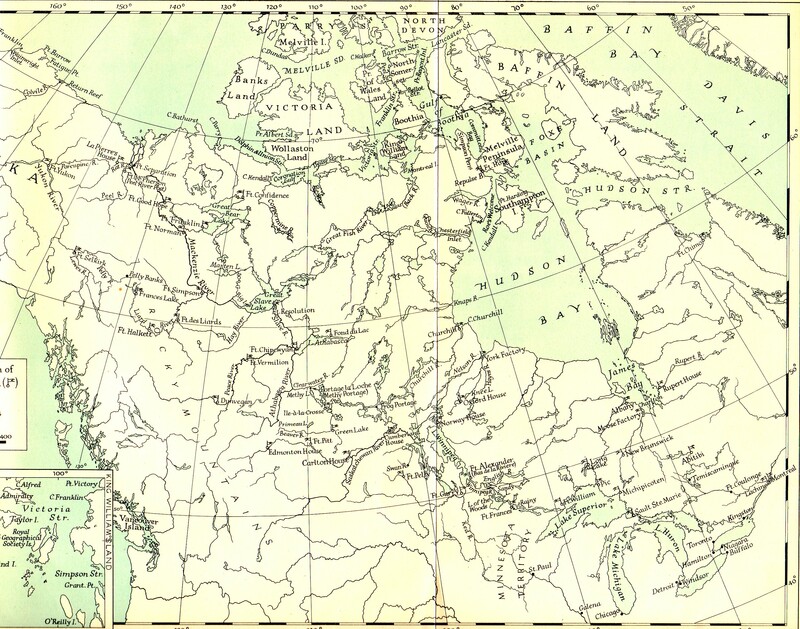 And as Wikipedia further points out, "By tracing the Coppermine River to the Arctic Ocean he had established there was no northwest passage through the continent at lower latitudes." On his return, he became the first European to see and cross Great Slave Lake. The overall story of Samuel Hearne, is an interesting one which I cannot go into detail at this place; but would include: his unusual manner and character when treating with his Indian friends, particularly his relations with Chief Matonabbee, 1770-1; his governorship of Fort Prince of Wales, 1776-87; his conflicts with the French, 1782, which led him to becoming a prisoner of the French and his return to England; and his return to the post on Hudson's Bay the following year only to find all that he had built-up in ruins. Hearne's health failed him, and, in 1787, he gave up his command at Churchill and returned to England. There he wrote of his experiences which resulted in his book published posthumously in 1795, A Journey from Prince of Wales's Fort in Hudson's Bay to the Northern Ocean. As the years advanced, his health continued to go down hill. Hearne died in 1792 at the age of 47.